- for Kamata, see below ! Ōta's hub is situated around the two stations Kamata and Keikyū Kamata, where the Ōta Ward Office and central Post Office can be found. 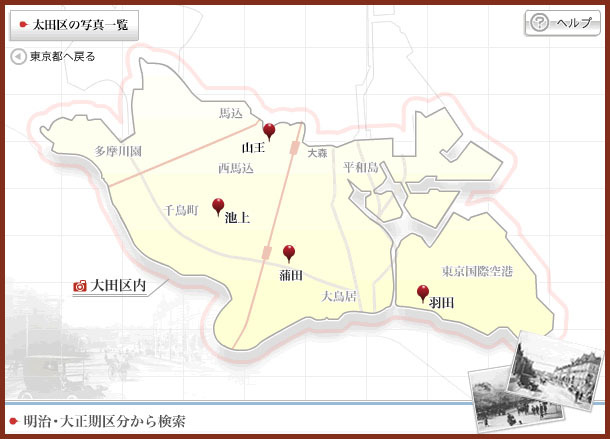 The ward was founded on March 15, 1947 merging the old wards of Ōmori and Kamata. 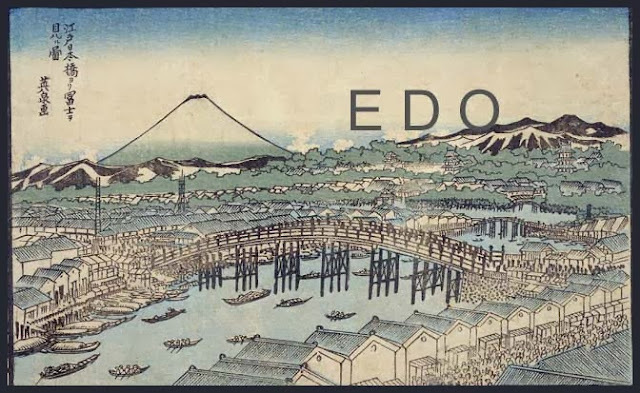 now the main domestic airport for the Greater Tokyo Area, was first established as Haneda Airfield in 1931 in the town of Haneda, Ebara District of Tokyo Prefecture. In 1945, it became Haneda Army Air Base under the control of the United States Army. In the same year, the Occupation ordered the expansion of the airport, evicting people from the surroundings on 48 hours' notice. With the end of the occupation, the Americans returned part of the facility to Japanese control in 1952, completing the return in 1958. Haneda Airport in Ōta was the major international airport for Tokyo, and handled traffic for the 1964 Tokyo Olympics.
. Oomori, Ōmori 大森 Omori district "Great Forest" .
. Denenchōfu 田園調布 Denenchofu 田園調布本町、田園調布南 .
. Magome 馬込 Magome district / Magomemachi 馬込町 Magomemura 馬込村 .
. Senzoku: 北千束 Kita-Senzoku 南千束 Minami-Senzoku .
. Tamagawa 多摩川 - 多摩川上水 Tamagawa Josui Kanal.
. Yaguchi 矢口 / 東矢口 / 矢ノ口 .
. Haneda 羽田 Haneda district, "wings and fields" .
. Rokugoo, Rokugō 六郷 Rokugo district, "six villages" . The slope goes from 山王2丁目 Sanno second sub-district to 山王3丁目 third sub-district. Here 八幡太郎鎧掛けの松 Hachimantaro hanged his armour.
. Minamoto no Yoshiie Hachimantaro 源八幡太郎義家 / 源義家 (1039 - 1106) . the mountains of Tanzawa and Mount Fuji can be seen in the distance on a sunny day. The 67,154 sq. m garden boasts many attractions including natural forest paths, a kofun (tumulus), an observation deck, a water botanical garden, a seasonal wildflower garden, a hydrangea garden and a mountain grass path. A huge tomb called “Kofun (tumulus)” that was made from the 4th to the 7th century has been reproduced as a life-size replica. This is a part of the back circular part of the large keyhole-shaped tomb mound, which has a horizontal stone chamber that was built in the 6th century in the Kanto region. The Kofun has been reproduced in the original shape that was built by the ancient people, so it can be compared to the current Kofun that is preserved in Tamagawadai Park. Please look at it as if you became an ancient person.
. Ikegami Honmon-Ji 池上本門寺 . a temple of the Nichiren sect south of Tokyo, erected where 日蓮上人 Saint Nichiren is said to have died. If believers of this sect die in Tokyo, their soul flies to Honmon-Ji and the 人魂 soul fire is seen entering the grave. If someone happens to see the soul fire around the grave, he might be able to see the face of the dead person for a moment.
. hitodama 人魂 / 人玉と伝説 Legends about the human soul fire . A disciple of Nichiren, 日法 Nippo, had made a statue of Saint Nichiren and painted the Mandala of Nichiren on it. 37 days after his death, Nichiren had become the local protector deity. 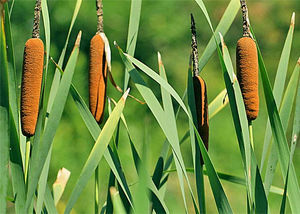 The name means "field of gama 蒲 (がま), a kind of bulrush. which was used to make mats and window blinds.
. gama 蒲 (がま) Gama cattail, reed mace, Phalaris arundinacea . Kamata go 蒲田郷 Kamata village in the Heian period. The Shrine 蒲田の稗田神社 Hieda Jinja in Kamata was built in 927. The Musashi Samurai clan of the 江戸蒲田氏 Edo Kamata lived in Kamata go. Later the Hojo became regents, and the village was again under the government of the Kamata clan. In former times the area was called ume-no-ki mura 梅の木村 Umenoki mura "Village of the Plum Trees". The flower of the Ota ward is the plum. The name "Kamata" has been used to refer to the area since at least the 900s AD. Historically, the area was famous for Japanese apricots (ume). Kamata was first linked to Tokyo by rail in 1901 with the opening of Kamata Station (now Keikyu Kamata Station) on the Keikyu Main Line. This was followed in 1904 by the opening of a separate Kamata Station on the Tokaido Line. Kamata became a ward of Tokyo City in October 1932, incorporating the historical towns of Kamata, Yaguchi, Rokugo and Haneda. 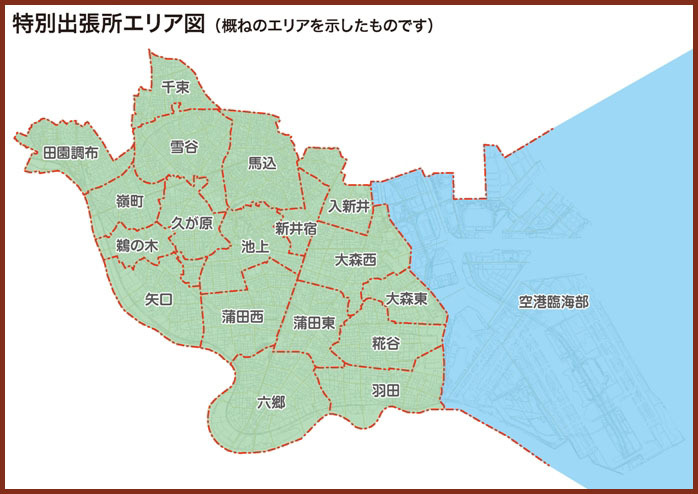 Kamata merged with the neighboring ward of Omori to form the ward (city) of Ota in March 1947. The entire Kamata area south of Ōmori was known for the cultivation of plum trees and was celebrated more for its early summertime fruits than its springtime blossoms. The gentle beauty of this print tends to distract the viewer from the structure intruding from the right. It is a cushioned palanquin known as a yamakago ("mountain palanquin"), once widely used for travel in Japan. The overgarment left casually on top suggests that a traveler has recently stopped off for a brief rest from the nearby Tokaido highway that linked Edo to Kyoto. the "Plum Mansion" (Umeyashiki), with its several hundred trees extending into the distance. The owner of the mansion was a medicine dealer from Omori, whose chief product was a cold remedy called 和中散 Wachusan. The structure on the right is an indigo cushioned palanquin of the simple A-frame type known as a "yamakago" ("mountain palanquin") and was used widely for travel in Japan, suggesting that a traveler had stopped off from nearby Tokaido for a rest, leaving an over garment on top.
. Ōmori 大森 Omori district "Great Forest" . and the postal station Ai no Shuku 間の宿 Station inbetween. Seiseki Kamata Umeyashiki Park is in the Kamata district of Ōta, Tokyo, not far from Umeyashiki Station on the Keikyū Line. 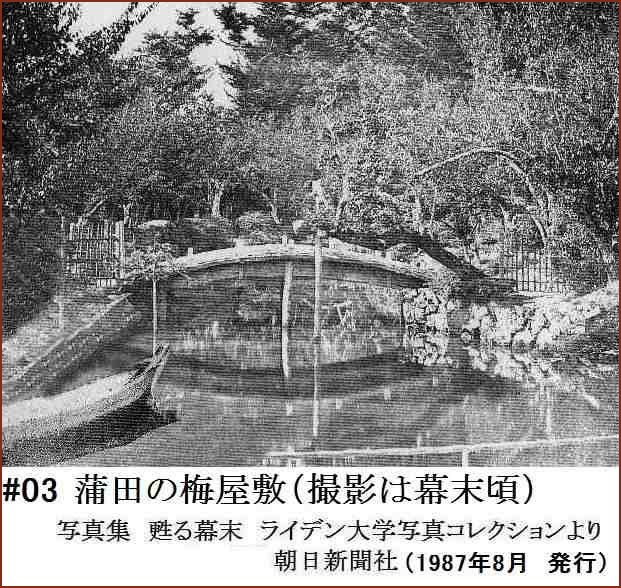 Tradition holds that local merchant Yamamoto Kyūzaburō, a hawker of patent medicine for travelers, founded the garden during the Bunsei era (1818–1831) when he planted plum trees around a teahouse he built alongside his store. 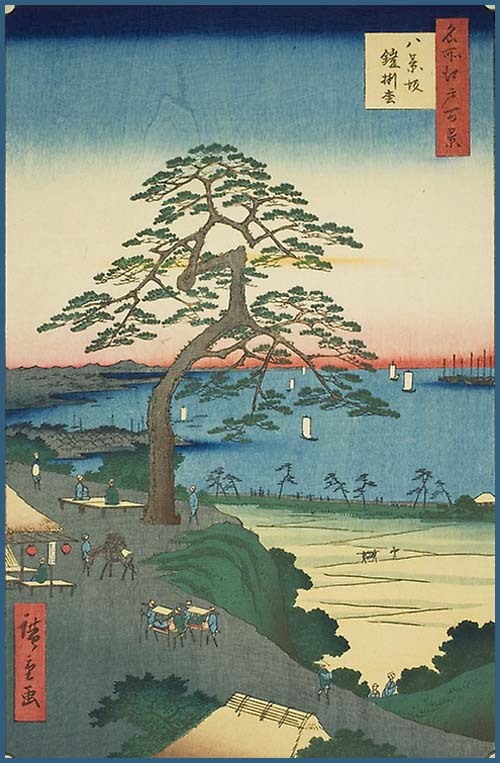 The lively scene depicted by Hiroshige suggests that Yamamoto’s trees attracted quite a crowd when in bloom. 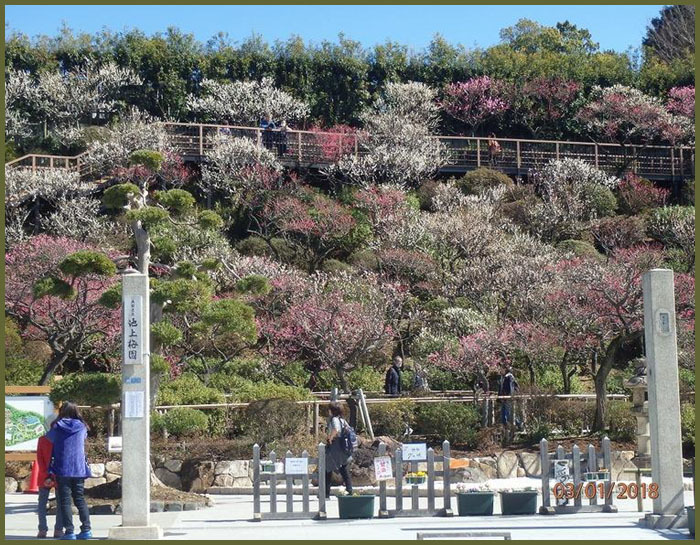 Stone monuments bearing poetic inscriptions selected by the haiku-loving Yamamoto as well as milestones are seen scattered among the blossoming plums. Many of these markers still stand today. 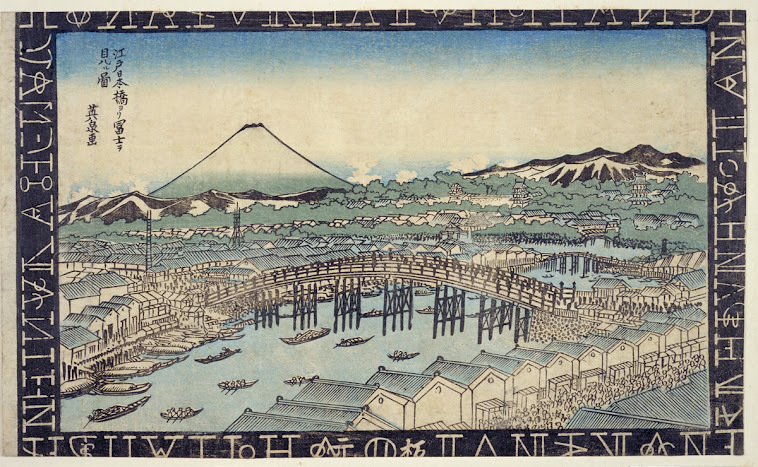 Emperor Meiji visited the park about 10 years after Hiroshige produced the wood-block print and found it so much to his liking that he returned many times thereafter. 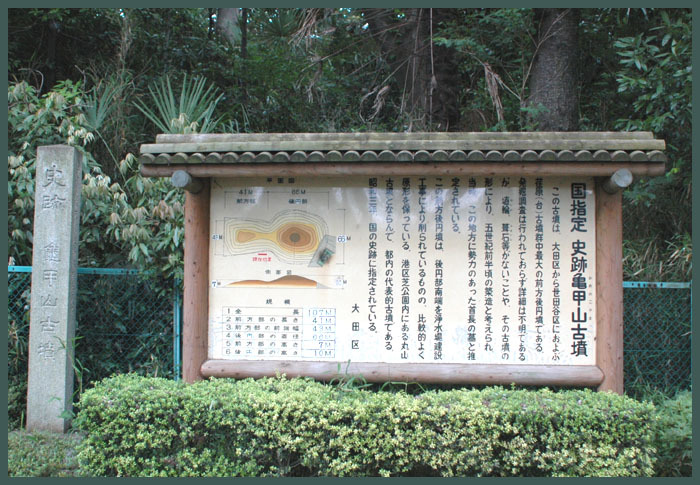 In honor of this imperial patronage, the term seiseki (literally “sacred place”) was added to the park’s name. I snapped this photograph on a February evening just as the sky above the blossoming plum trees began to redden. 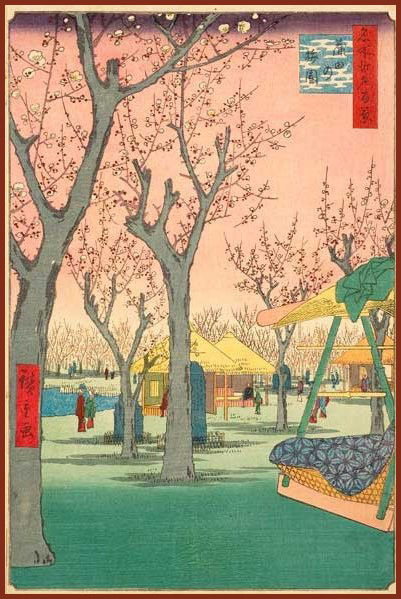 Although developments like the expansion of National Route 15 have made the park smaller than in Hiroshige’s day, the pond, stone monuments, and wisteria arbor above the benches all evoke the atmosphere of the original print. ... The property originally belonged to the Yamamoto Kyūzaburō, a merchant who sold a patent medicine known as wachūsan — said to be effective against food poisoning, heatstroke, and other ailments—to travelers passing by on the nearby Tōkaidō highway. Local vendors of the remedy, of which there were several, each maintained their own teahouse to help lure customers. Yamamoto’s teahouse, built of the finest plum wood, is said to have been particularly popular.
. Hieda Jinja 薭田神社（ひえだじんじゃ） . The shrine legend tells us that in the year 709 the Buddhist monk, Gyōki, made shintai (divine images) of Amaterasu Ōkami, Hachiman, and Kasuga and enshrined them.
. Aragamisama, Koojinsama 荒神様 Arakami Sama, Kojin Sama .
. Benjogami 便所神 Female God of the Toilet .
. Hōkigami 箒神 Hokigami, Hahakigami . These three deities show up for a birth. So pregnant women have to venerate them every day to get their help when they need it. The toilet has to be kept especially clean. If a newborn baby has a bruise at the bottom, it signifies that Arakami Sama has been there and pinched it to come out fast. The Hokigami must be honored be never stepping over a broom. A broom must never be used to hit people, otherwise the birth might become a problem.
. hinotama, hi no tama 火の玉と伝説 Legends about fire balls . The Hinotama fireball has a different red color that then hitodama 人魂 a human soul fireball and makes a sound like パチパチ pachipachi. It is also called kanetama カネ玉 "money ball". It appears if someone goes bankrupt. On an early winter night when it was quite dark, a visitor to a local food store saw a soul fire hovering in the persimmon tree like a red full moon and then disappearing fast. Others see the soul fire as a light red turning into white-blueish, sometimes round ball with a small tail. One person observed it falling to the ground and later found something like soap on the road.
. Nitta Yoshioki 新田義興 (? - 1358) . A shrine at 矢口渡 Yaguchi no Watashi, the Nitta Shrine, is dedicated to Yoshioki, who was executed there. He is revered under the name Nitta Daimyōjin (新田大明神). Wilthin the shrine compound, it is not allowed to page leaves from plants. If people do so, they will be cursed by Yoshioki. Children of the 6th grade were having a lesson of natural science, when one girl suddenly fell to the ground and became unconscious. She has been posessed by Sen sama! This is one of the chants of invoking a fortune-telling game. The townspeople near Ota ward believe that a priest had been reborn as a bull. During the end of the Meiji period, around 1910, the priest of a temple had died. The representative of the parishioners carved a letter into the bone of the body before the burial. A while later they found a bull with the letters on his body.